Arena Ferox as it appears in Smash. Arena Ferox (フェリア闘技場, Felia Arena) is a stage in Super Smash Bros. for Nintendo 3DS and Super Smash Bros. Ultimate. In Smash 3DS and Ultimate, Lucina is fought here for her unlocking battle and Chrom is fought here when being unlocked in the latter. 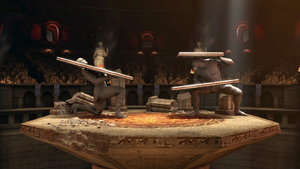 The Arena Ferox stage consists of a flat, medium sized stone platform. Similarly to Pokémon Stadium, the layout changes periodically. There are five different variations that can appear, in random order. The first variation features destructible statues similar to those found in the second segment of Castle Siege. 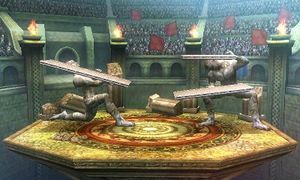 Both statues hold up soft platforms, with the left one holding one at an angle into the stage's center, while the right one holds two on top of each other: the bottom one is angled towards the center of the stage, and the top one is parallel to the stage's floor. There are crumbling pillars in the background. The second variation features a moving set of gears with moving soft platforms to its left. Just right of this mechanism is a large, hard platform. To the rightmost part of the stage is another soft platform, which is the closest to the floor of the three platforms. The third variation features two high, hard platforms at each end of the stage. The rightmost platform turns into a wall that connects to a small soft platform. In the middle of the stage is a similar structure to the rightmost platform, only with a high soft platform instead of a high hard platform. There are crumbling pillars in the background. The fourth variation is the only one to be symmetrical, aside from the stage's default, flat form. It includes three soft platforms suspended by chains, in a somewhat similar layout to Battlefield. In the middle of the stage is a wall that suspends another soft platform. A wooden tower and wall appear in the background. In Super Smash Bros. for Nintendo 3DS, the Ω form has only the main platform featured. The stage also does not transform. In Super Smash Bros. Ultimate, the Ω form and Battlefield form are similar to SSB4's Ω form with the addition of the rubble in the background; however, the main platform does not extend below the blast line and is resized and reshaped to match Final Destination and Battlefield, respectively. The three soft platforms of the Battlefield form are based on the ones in the normal form. Arena Ferox as it appears in Fire Emblem Awakening. This stage is based on the Arena Ferox from Fire Emblem Awakening. It is a gladiatorial combat arena located in the nation of Regna Ferox, a warrior nation that lets strength in combat dictate its politics, and the rulers of the nation regularly use it to determine their future successors. Early in Awakening, the main character, Chrom, traveling from the halidom of Ylisse to the south, earns the support of the East-Khan, Flavia; however, due to her having lost the last tournament to the West-Khan, Basilio, Chrom and his companions must fight in this arena to ensure that Ylisse's future dealings regarding recent threats to the continent can proceed. His opponent is a masked sword-wielder named after Marth. Arena Ferox in Super Smash Bros. for Nintendo 3DS. The first variation of the stage, with statues. The second variation of the stage, with platform-moving gears. The third variation of the stage, with ruins in the background. The fourth variation of the stage, with platforms suspended from chains. Pit and Fox fighting in the arena. Bowser and Samus fighting in the arena. Mega Man and Samus both charging up their Charge Shot. Marth performing Dancing Blade on the stage. Arena Ferox prior to transformation. Captain Falcon taunting Little Mac in Super Smash Bros. Ultimate. Ganondorf using his forward throw on Marth. Ganondorf turning into Demon King Ganon. Mario using his F.L.U.D.D. on the stage. Pikachu using its down aerial on Diddy Kong. Arena Ferox, in its original form from Awakening, is the setting of Lucina and Robin's reveal trailer, showing the two of them and Chrom fighting Captain Falcon (who was also revealed in the same trailer). This is the only Fire Emblem stage in the Super Smash Bros. series to be based off of a particular location rather than a generic stage based on a recurring theme. While the Super Smash Bros. for Nintendo 3DS version of this stage much resembles how Arena Ferox looked in-game in Fire Emblem: Awakening, the Super Smash Bros. Ultimate version appears to take more after how the area looks in cutscenes in that game. This is evident through the lighting on the arena proper being much brighter than the lighting on the stands, putting more focus on the battle. This page was last edited on April 16, 2019, at 08:28.